Well damn, and here I was hoping I could finally implement my Pitfall-esque rope mechanic. Some day .. It looks like this effect doesn't work with the multisprite kernel, sadly. Any chance that I'm mistaken? Sad but correct. The multisprite kernel does a bunch of mid-screen hmoves that reset the effect, messing it up. * There is no way to exploit this trick on the Flashback Portable (I guess this was too much for me to hope for given that it is based on a hardware bug. It worked as expected in Stella, however). At work right now, but AFAIK it should work without NO_BLANK_LINES. Since the missile will be under kernel control, you'll need to position the missile vertically and set it's height. The effect should show up where the missle would normally be. Hopefully this will be my last question, but it looks like this bug only applies to missile 0, and not missile 1? I tried setting ENAM1=2 and positioning missile 1, but no luck. My hope was to be able to use the other missile so that I could use a kernel option that took away missile 1 instead of missile 0 (player1colors) and still retain one working missile. Also confirmed - I had missed changing the assembly on my previous attempt. Thanks again! Not a problem. You're welcome. Here's a slightly different example in case it is useful to anyone. Use the joystick to appear to move the ship in 8 different directions. I commented the code to show what needs to be changed to use a different missile or the ball instead in case anyone else could benefit from that. Now I just need to dream up a space game where 8 directions of movement would be fun. This example uses both missiles on the screen at the same time and with Fixed Point 8.8 variables which can create some nice Parallax effects. Is it possible to glitch the ball or players in the same way? I've been fiddling around with the variables but cant make them repeat. Well done - that is some trippy stuff! It's technically possible, yes. I'm not sure what the issue is - I'll give it a shot in the next couple days, if you don't beat me to it. The problem I was having was putting all 5 objects in at the same time, I was able to put one or two in before. This new example uses all 5 objects in the glitch player0,player1,ball,missile0 and missile1. You can adjust the direction/speed in the same way but are unable to turn them on or off as before. I've noticed that the starfield effect seems to somehow interfere with horizontal player movement, as shown in this example. It happens regardless of whether the effect is done using either missile or the ball. Any ideas on what is causing this, or how to work around it? Thanks for the bug report! I've already updated the previous examples in this thread. I'm trying to use missile1 instead of missile0 for the starfield. This seems like it would be a simple change in the DPC+ kernal. Change all instances of missile 0 to missile 1 and hmm0 to hmm1. But I can't seem to get it to work. Am I missing something? HMOVE cancels out the starfield effect. Load the ROM in Stella. you'll notice that bB's DPC+ Kernel hits HMOVE every-other-scanline. Your attachment works perfectly for me, when I compile it myself. Make sure you're using the latest bB and remove all *.asm files from your build directory - the first version of the bB starfield effect that I released used a custom assembly file, but I incorporated the changes required into my bB dist. When I did that, I recall cleaning the fix up a bit. Indeed it does. But if you're already hitting HMOVE continuously, you can move some object(s) in large amounts each time, and get pretty much the same visual result as the starfield effect. It's technically not the starfield effect, since it doesn't utilize the TIA bug, but I think the TIA bug version amounts to the same thing - the object keeps getting (automatically) shifted large amounts each scanline. As a bonus, the "hit HMOVE every scanline" version of the effect should be universal and consistent between TIA versions, unlike the TIA bug version. I have a bB DPC+ example near the top of this thread, which includes a binary. I updated to the latest bb. That did it. Thank you. How do I change missile to ball? 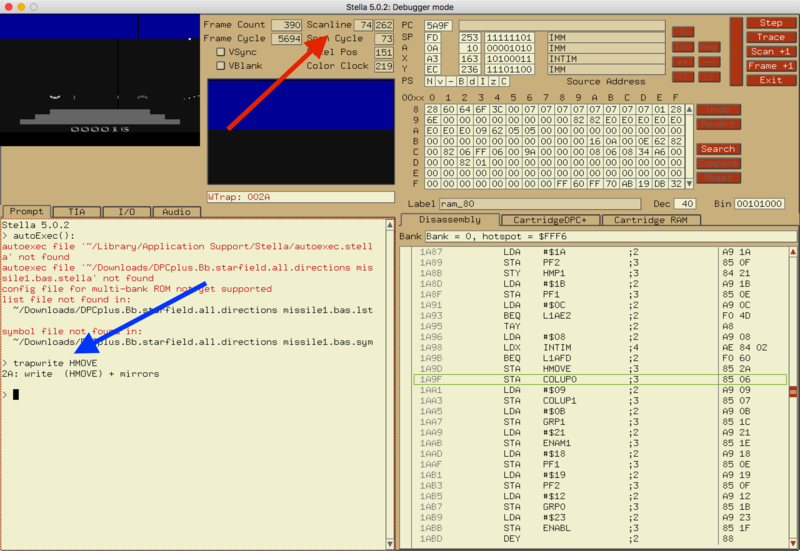 Change missile0x to ballx in the bB code, and change HMM0 to HMBL in the assembly portion. Hm, I did as you said, and I put it in bank 2, all I get is a red line in the top of the screen following player0, what did I do wrong? rem ** You need to ensure the missile0x position ranges from 0-159.
rem ** If missile0x is 0 and decreases, then set it to 159.
rem ** If missile0x is 159 and increases, set it to 0.